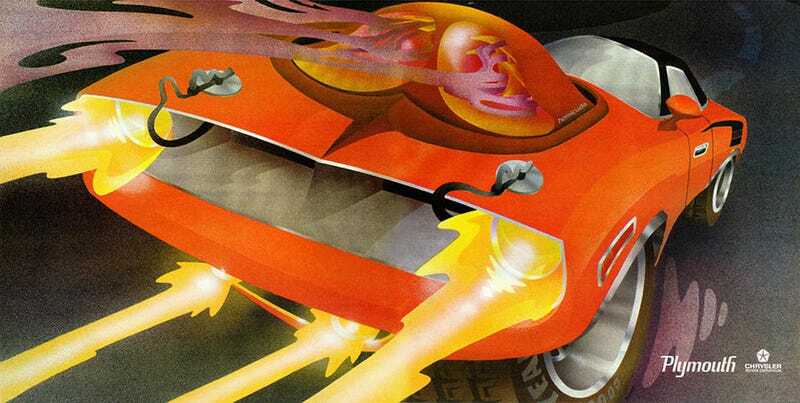 Most certainly inspired by Peter Max's art, this LSD-infused print ad for the Plymouth Hemi 'Cuda is wonderfully seventies. Chrysler should get some inspiration. Chrysler is all about serious messages nowadays. Their adverts are no fun at all. Of course I do understand why. Detroit as a city is in deep trouble, Chrysler is owned by an Italian, and the market remains tough. Still, bright colors would at least cheer up the office. The Rapid Transit System was their idea to promote cars by pointing out how many racing components made it from the tracks to the top of the production lineup. You could get your 'Cuda with a 426 Hemi, heavy-duty Road Runner suspension and a "pistol grip" shifter handle. Sounds like fun, and fun sells.